I (Mats) have since several years had the following cutie as background on my computer desktop: Buttons from Little Fluffy Adventures. I recently changed computer, but at last he is back again! He is such a cutie with his little round head! This entry was posted on Wednesday, February 19th, 2014 at 2:31 pm	and is filed under Bunnies. You can follow any responses to this entry through the RSS 2.0 feed. You can leave a response, or trackback from your own site. 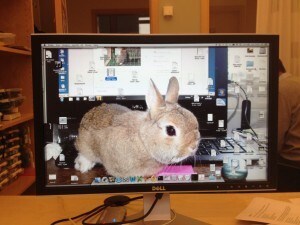 I wonder how Mats can ever get any work done when he has such a cute Little Bunny on the computer screen! Mats that’s crazy! But cool at the same time. I tell you, Buttons shares my office now and I am very unproductive at the moment… he DEMANDS smooches and head strokes all the time!